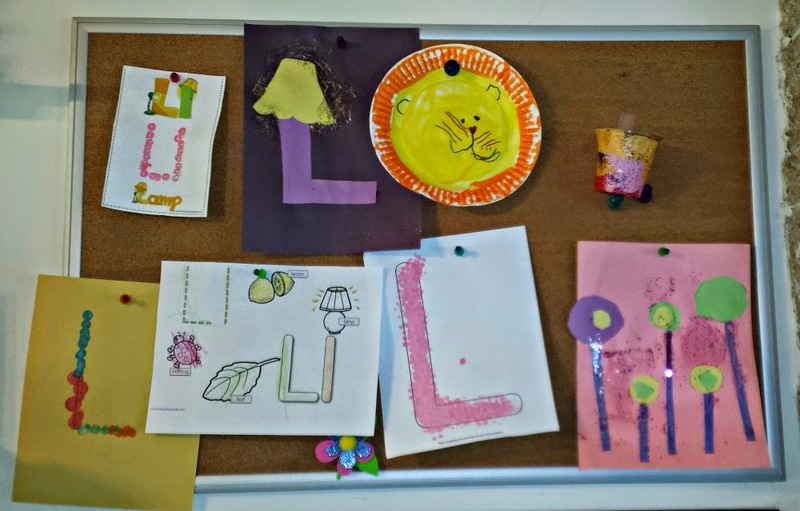 Our first unit in our "official" preschool was the letter L.
She was supposed to use a Lego and paint and stamp colors on the letter. She actually painted the letter so you can't even tell she used a Lego, lol. On black construction paper we glued a purple L on it. We added a lamp shade and gold glitter for light. She cut circles and straight lines out of construction paper. She glued them down and decorated them. She went s little crazy with the glitter glue. We also did the activities I listed in this previous post like using Handwriting Without Tears, making the letter out of playdough and in sand, Do-a-dot letters, writing on paper, Q-tip letters, and more. This was a fun week! Next week we are moving on to the letter F!